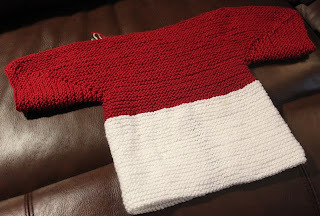 I'm making progress on a bunch of projects but nothing is getting finished. 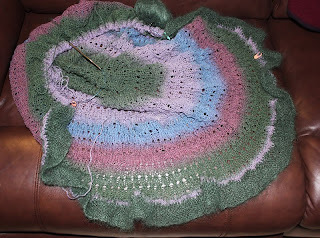 The Never-Ending Pi Shawl - I'm halfway done with the knit-on border. 276 stitches bound off; only 300 (times 16 = 4,800 total stitches) left to go. Leanne's Baby Surprise Jacket is off the needles. 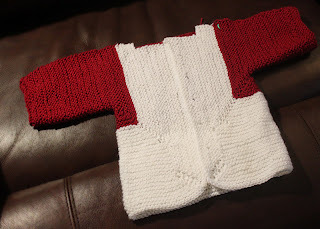 I need to sew the shoulder seams, add buttons - little red ladybugs, of course - weave in my yarn tails and it's done. 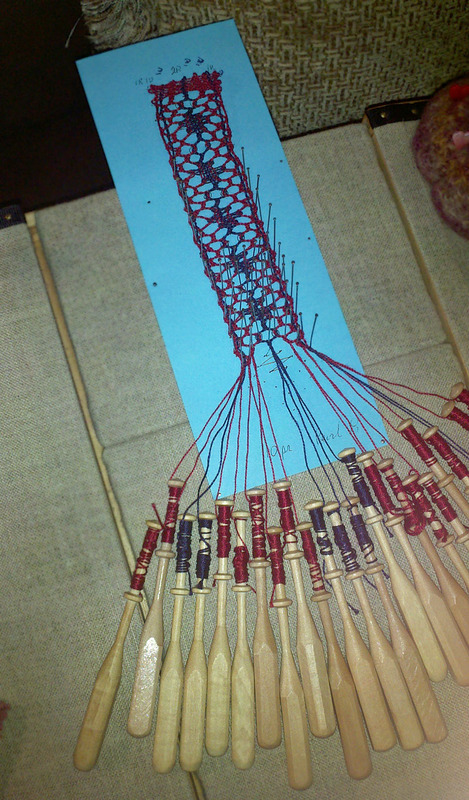 My latest bobbin lace bookmark. It's done and off the pillow now. Looking for another project to start. LOVE this craft. 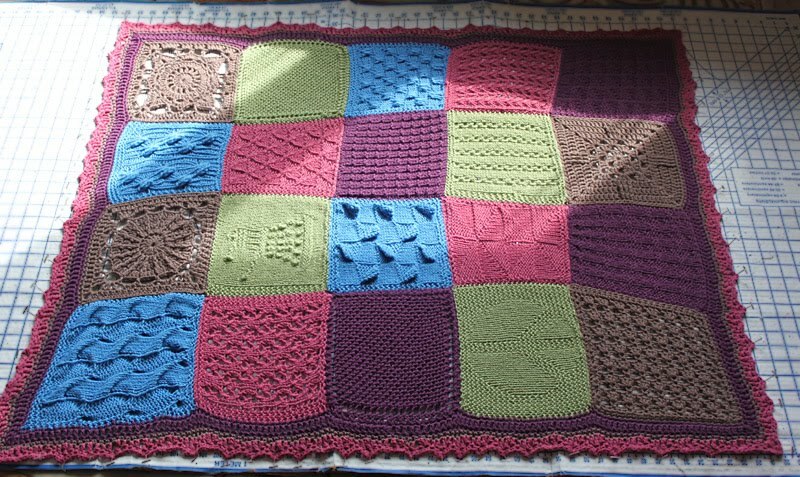 I contributed the four brown squares* and the crocheted border to this baby blanket the yarn shop ladies made for Anne's soon-to-arrive little girl. Sewing all the squares together would have made me nuts, but a border? That I can do. The colors are unusual - especially for a baby blankie - but I love how great they look together. Hope the Little Miss gets lots of use from it. *Close-ups of the squares and additional details are here, here, here and here. 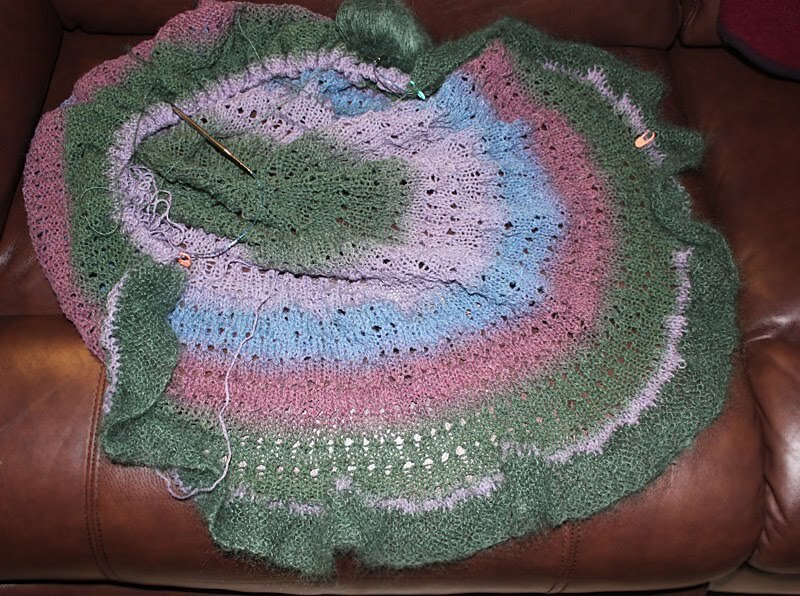 I like the colors of the baby blanket. It's not your same old same old. I like unique. I am in love with it!!!! Thank you, Thank you, thank you! I can't wait to wrap her up in it (gotta make it to the end of next Wed though).